Dress codes are supposed to be helpful. They’re nominally intended to remove any ambiguity as to what to wear, but, more often than not, they can end up obfuscating rather than clarifying what’s expected. Thankfully, FashionBeans is on hand to break down the most commonly used – and abused. And we don’t just mean ‘broken’. As with sartorial standards generally, there has been a degree of slippage over the years, compounded by the fact that your host might not know exactly what it is they’re saying on that invite either. Which means there’s no harm in checking in with them to understand exactly what they’ve got in mind, and what leeway they’ll allow. That might sound stupidly obvious. But you know what else is stupid? Dressing inappropriately. And again, while it might be self-evident, the strictness of these strictures is directly proportional to the gravity of the event. If you’re Pharrell at the Oscars, by all means reach for the Lanvin tuxedo shorts. If you’re getting your knighthood? Not so much. This shindig couldn’t get fancier if Drake and Iggy Azalea were co-hosting. White tie is a level up from even black tie in formality – and no, it does not mean ‘a white tie’. What it does mean is a black tailcoat (not to be confused with a morning coat – see Morning Dress) and matching black trousers, a white waistcoat, a wing collar shirt, a bow tie, and a pair of patent shoes. If you don’t have these in your rotation, get thee hence to the hire shop. This is not a dress code to be trifled with. The good news is that invitations which stipulate this are extremely rare unless you are a Ferrero Rocher-munching diplomat or extremely rich and/or posh, in which case you’ve probably got all of the above in your rotation anyway. Also, a top hat is not considered strictly necessary nowadays, so you can let that one slide. A word (well, two) of warning: ‘formal attire’ can technically refer to the above for evening events, or morning dress (see below) for daytime. Chances are, your hosts just mean ‘smart’. But check yourself before you deck yourself out. The daytime equivalent of white tie, hence why it’s also referred to as ‘formal day dress’. You should be wearing: a morning coat with tails in black or grey, grey trousers (or grey and black striped), a waistcoat (usually light to mid-grey or beige), a double-cuff shirt with turn-down collar (usually white but blue or pink is acceptable), a tie or cravat, polished black shoes and a top hat. Again, you can’t really mess around with this kind of thing. At least not if you want to get into the royal enclosure at Ascot. Or the wedding album. Or ‘dinner jackets’, ‘dinner dress’, ‘tuxedo’, ‘cravate noire’. Again, it doesn’t mean ‘a black tie’: it means a dinner suit, or a tuxedo if you’re American. This is materially different from a black suit, with contrast lapels in a fabric like grosgrain or silk and braiding down the leg. If you’re the kind of person who insists on saying dinner suit rather than tux, then yours should be midnight blue, which is historically more fitting of the code and looks like a richer black under artificial light. You’ll also want a dress shirt with a turn-down collar and fancy front of some kind, usually with detachable studs and cufflinks instead of buttons. At a push, you could probably get away with a normal white shirt; a wing collar shirt is strictly speaking for white tie. Shoes-wise, reach for highly polished Oxfords, although patent is acceptable. The dinner suit started out as a more relaxed alternative to tails, but for most of us today, it’s as smart as it gets. Slippers are – unsurprisingly – really for ‘at home’ invitations. Can you wear a black suit? Well, you shouldn’t – as we’ve outlined above, it’s not the same thing at all. And know full well that if you do, someone may ask you to fetch them another drink, or transport a top-secret cargo across Europe in an Audi. A (black) cummerbund is not essential, especially if you have a spare hand to hold your opera tickets. But it can do a good job of stopping your shirt showing between your jacket button and trouser waistband, as can a black waistcoat. ‘Semi-formal attire’ is upper-class code for black tie so, again, depending on the circles you’re moving in, this could actually just mean smart-casual. Another reason to pick up the phone before you gussy up. Really this means black tie, but it’s also sometimes used (incorrectly) to refer to cocktail attire (see below). Unless it’s preceded by ‘full’, in which case it means white tie. Hit up your hosts to clarify. One of the most misleading codes. Your hosts are going to wear it, and want you to wear it too, but they’re politely giving you an out in case you can’t, or won’t, rent or buy. That doesn’t mean you should take it. Unless it’s really impossible, just wear black tie. A normal suit with a long tie – AKA ‘Hollywood black tie’ – is more acceptable here. But it should be as close to a dinner suit in DNA as possible. Normally, black tie is asking you to operate within strictly defined parameters to create a uniform effect. It’s not – out of respect for your hosts and the occasion – the time to flex your fashion muscles. This, however, is an invitation – albeit an annoyingly vague one – to do something a little more unusual than the typical penguin suit. That could be a fabric like velvet, a colour or pattern, or some other flourish. Trainers? Maybe. How far you can push it really depends on the hosts and the context. If your invitation says ‘with a twist’, then you may want to re-evaluate your friendship with these ‘zany’ people. Jeeves, fetch my shotgun. Sadly, this does not mean a blouse-like shirt inspired by the seminal Tom Cruise film. Instead, it means a suit, but with something of the night about it: sharply cut, slim fitting, dark in colour, maybe even a bit of a sheen to it. You’ll also be wanting a shirt (white is safest and smartest, nodding to the traditional eveningwear codes of white and black tie), a tie and some polished black shoes – again, think sleek. A fine-gauge roll neck or ‘air tie’ could also fly. The key thing here is that you don’t look as if you came straight from the office, even if you just took a deodorant shower and pulled a fresh shirt out of your bottom desk drawer like a latter-day Don Draper. Unlike most corporate jargon, this one’s pretty straightforward: a safe-for-work notch-lapel suit, shirt, tie and shoes. Business-casual will forever be twinned with smart-casual (see below). In short, you don’t need to wear a suit. A separate jacket or blazer is advisable though, with a button-up shirt (button-down collars are ideal), shoes that are less formal than Oxfords but smarter than trainers (e.g. brogues or loafers), and maybe a tie. If in doubt, wear one: you can always take it off and stick it in your pocket. You can probably incorporate some patterns and lighter colours here, too; you might even get away with plain, dark jeans. Then again, you might also get your P45. Chinos bestride the smart-casual divide like a khaki-coloured colossus. As above, but perhaps not quite so smart. If it’s not a work context, then you can probably get away with no tie, a polo shirt, jeans, maybe even without a blazer. Again though, consider the relative seriousness of the event, and your hosts. Ostensibly it means that there isn’t a dress code, but that doesn’t mean “don’t bother”. 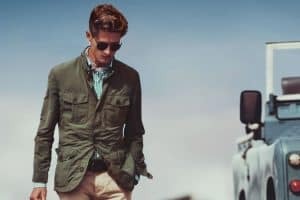 You should still make an effort to be slightly smarter than normal: an unconstructed or knitted blazer or a dark casual jacket like a bomber, a casual shirt or plain tee, jeans that aren’t distressed or distressing (i.e. bootcut) and footwear that isn’t trainers – or at least some minimal white (and clean) ones rather than your Yeezy Boosts or beaters. Have some respect, man. Have you got dress codes cracked? Or are they still an Enigma? We invite you to comment. But only smartly, not casually. Or with a twist.